First you set your type of mouse: 1, 2 or 3 button mouse. 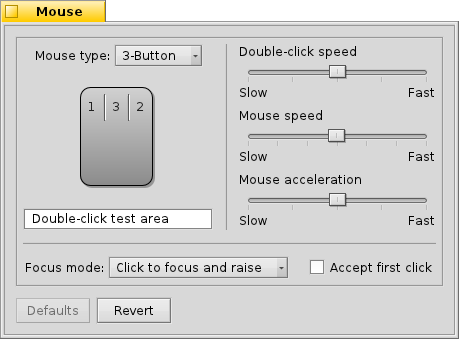 You can simulate the 2nd (=right) mouse button by holding down CTRL while left-clicking. For the 3rd (=middle) mouse button, it's CTRL ALT and a left-click. You can rearrange the mouse buttons by clicking on them and choosing their new meaning from the pop-up menu. With the sliders to the right, you adjust double-click speed, mouse speed and acceleration. The test area below the mouse graphics can be used to check if the double-click speed meets your taste: if double-clicking a word doesn't select it, it's set too fast (or you'll have to get used to clicking quicker...). Click to focus and raise This is the default setting: you click a window and it gets focus and is raised to the top. Click to focus Clicking a window only gives it the focus, but won't raise it automatically. To do that, you'd have to either click on its title tab or border or click anywhere while holding the window management keys CTRL ALT. Focus follows mouse The window under the mouse pointer automatically gets the focus. Actually raising it, is done as described in the Click to focus mode. Activating Accept first click relieves you of having to first put the focus on an inactive window in order to trigger widgets like a button or menu. This bears the risk of unintentionally closing a window, for example, by accidentally hitting the close button when aiming for the window tab. On the other hand it speeds up your workflow considerably. All settings are immediately applied. Defaults resets everything to default values. Revert brings back the settings that were active when you started the Mouse preferences.